A couple of weeks ago I saw Northern Ballet’s The Great Gatsby at Sadler’s Wells. It was a vibrant production, encapsulates the spirit of the jazz age, and the choreography allowed the company to demonstrate their versatility and acting ability. We were sat at the back of the large Sadler’s Wells auditorium, but the production carried to the back of the Second Circle – the simple sets allowed the dancers and choreography to really stand out. Northern Ballet always takes interesting and varied subjects for their full-length productions – their repertoire includes Hamlet, Cleopatra and Wuthering Heights. Yet they translate these complex stories into dances that are surprisingly easy to follow. David Nixon’s choreography, and the acting ability of the dancers, means that Northern Ballet excels at narrative-led ballets. While it’s impossible to translate the language of Fitzgerald from the page into an entirely visual medium, as a standalone production it is highly entertaining. The emotional capacity of the Northern Ballet dancers also translates into their forays into non-narrative works. 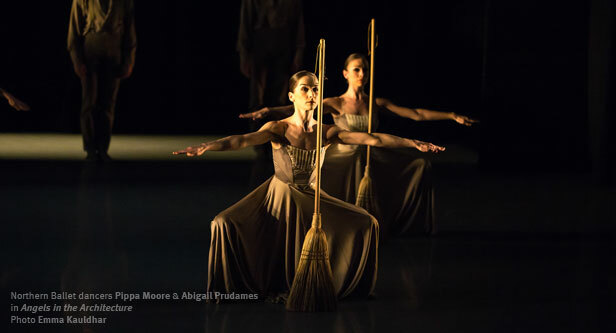 The company’s recent Mixed Programme at their Stanley and Audrey Burton Theatre featured Mark Godden’s Angels in the Architecture, a beautifully simplistic piece inspired by the Shaker people, using brooms, chairs and skirts, and Hans van Manen’s powerful and dynamic Concertante. But the piece I was most looking forward to was Luminous Juncture, a new piece by Kenneth Tindall. Before seeing his debut piece Project #1 last year I didn’t have any preconceptions, and the piece left me stunned in my seat at the emotion and physicality of the performance. I haven’t seen anything as good since, and so I was slightly worried that Luminous Juncture wouldn’t live up to my (now very high!) expectations. But after an explosive start which certainly grabbed the audience’s attention, it had me as captivated as Project #1 had the year before, and more than once I had to sit back having found myself leaning forward to the edge of my seat. The combination of music, movement and light led to a sublime piece of dance that was thoroughly engaging. Often when choreography is overly demanding it can lead to movements which, though very impressive, can detract from the overall impression of the piece and leave it more like an acrobatic circus feat. Yet Luminous Juncture featured seemingly impossible balances and lifts, expertly performed by the dancers and woven seamlessly into the choreography, creating beautiful and striking phrases and images. Perhaps because he is still dancing, Tindall’s choreography brings out the best in his dancers, showcasing their abilities. Up close in the Stanley and Audrey Burton Theatre the dancers can really showcase their emotional range, and you can appreciate the full force of their strength, flexibility and athleticism. Northern Ballet are consistently producing high-quality, inventive and entertaining work, in Leeds and on tour. Now I’m looking forward to seeing A Midsummer Night’s Dream in the summer.